March 19 is the Catholic Feast of St. Joseph, the husband of the Blessed Virgin Mary and the step-father of Jesus. The cult of St. Joseph was brought to New Orleans by the thousands of Sicilians who came to the city in the late 1800s. As the Sicilian community grew, their culture, traditions, and even their saints grew strong. Rather than a chronology of Italians in New Orleans, here are five important things they’ve given us over time. The Italian community in New Orleans is dominated by people of Sicilian heritage. Sicily went through some rough times in the late 1800s. Mainland Italy was in the midst of rejecting monarchy and uniting as a republic. Sicilians resisted those from outside the island coming in and taking over, and the island was under martial law for years at a time. This strife ruined the economy of Sicily, creating waves of emigration, in the same way famine did in Ireland in the 1840s and 1850s. Sicilians took ship for the major ports of the United States, many staying in the country’s second largest port, New Orleans. The Sicilians brought their culture and cuisine with them, particularly Italian-style tomato sauce. Living on an island meant many Sicilians made their living as fishermen, and their diet reflected this. Being close to the sea is one of the reasons so many Sicilians didn’t move further inland. Just as she absorbed the French, Spanish, and Afro-Caribbeans before them, New Orleans absorbed the Italians. New Orleanians took the idea of Italian-style tomato sauce and mixed it with roux, their flour-and-grease base for sauces. Over time, the classic “red sauce” became “red gravy,” called that to distinguish it from the “brown gravy” New Orleanians made for generations. To make the distinction between traditional cuisine and the modified style of Italians raised in New Orleans, some restaurants and restaurant reviewers began to refer to the modified style as “Creole-Italian” cooking. As immigrants came to New Orleans, the original Creoles abandoned their long-time neighborhoods of the Vieux Carre, Faubourg Marigny, and Faubourg Treme, moving Uptown. The Italians in particular took advantage of the housing opportunities this opened to them. The Sicilians spread out into what is now known as the Lower Quarter. The “French Market” became even less “French,” as Sicilian grocers and butchers moved in alongside the Germans and Creoles already there. Unfortunately, one of the things that motivated Sicilians to emigrate followed them across to the New World: the Mafia. Organized crime elements began to assert themselves in the French Quarter. In 1888, newly-elected mayor, Joseph A. Shakspeare, appointed a former NOPD detective, David Hennessy, as police chief. Hennessy pursued the Matranga and Provenzano crime gangs, arresting their leaders and working towards their convictions and imprisonment. On October 15, 1890, Hennessy was assassinated. Leaders of the Mafia gangs were rounded up, indicted, and tried. The trial ended in acquittals and mistrials, leading to the infamous lynching incident on March 14, 1891, where 11 Sicilians were executed. The community survived the incident, however, and eventually dominated the Lower Quarter, spreading into the Ninth Ward. Not only had Sicilians established roots in the French Quarter, but those seeking to farm the land moved upriver from the city, to Kenner and Little Farms (now River Ridge). These men were called “truck farmers,” because their land was far enough away from the city that they had to haul their crops in by wagon, later by truck. They would sell their produce in the Farmer’s Market, stopping for lunch at one of the groceries along Decatur Street. The groceries would lay out cold antipasti spreads during the day, to sell for lunch. In 1906, Salvatore Lupo opened Central Grocery at 923 Decatur Street. Lupo observed that a traditional antipasti spread did not lend itself to America’s rapidly-developing “grab-and-go” culture. 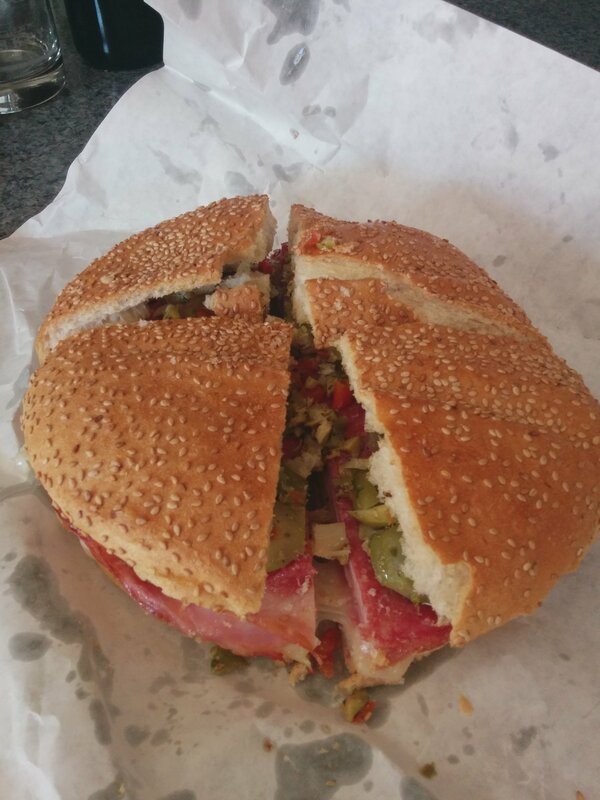 He began to combine some of the antipasti items, such as mortadella, cheese, ham, and olive salad, on loaves of round Italian bread, creating the now-famous muffuletta sandwich. The truck farmers could pick up a muffuletta, and essentially eat their antipasti as a sandwich on the return drive to Kenner. Other groceries and restaurants picked up on the muffuletta, which became a New Orleans institution second only to the po-boy in our pantheon of sandwiches. As the Sicilians established themselves firmly in the 1870s, the community’s leaders lobbied Archbishop Perche to provide them with a church larger than the wood-frame structure on Decatur Street and Esplanade Avenue they were using. In 1873, the archbishop gave the Sicilians permission to fix up the old Mortuary Chapel, located on N. Rampart Street, a block down from St. Louis Cemetery Number One. The chapel had been abandoned since 1868, but it was restored, and renamed the Chapel of St. Anthony. In 1903, Archbishop Chapelle turned the chapel and its parishoners over to the Dominican order, whose priests encouraged and nurtured the Old-World traditions and rituals of the Sicilians.By 1915, however, the popularity of the Storyville red-light district, along with the construction of Terminal Station (the Southern Railway passenger depot, located on Canal and Basin Streets) made St. Anthony’s less appealing as a focal point for the Italian community. Archbishop Blenk agreed, and allowed the Sicilians to take over the old archbishop’s chapel on Chartres Street, next to the Old Ursuline Convent. Originally named Stainte Marie de l’Archeveche, the church was re-named St. Mary’s Italian Church. The archdiocese acknowledged the growth of the Italian community, the loss of their traditional place of worship on Rampart Street, and the desire to give the Dominicans a new home. A new St. Anthony of Padua parish was formed, focused on a church to be constructed on Canal Street, near the cemeteries. Even though St. Anthony, as well as several other churches in metro New Orleans have strong Italian roots, St. Mary’s on Chartres Street is still the official “home” of Italian Catholics in the city. The story goes that Sicily was ravaged by drought and famine centuries ago. The people prayed to their patron, St. Joseph, for deliverance from these trials. The rains came, the crops grew, and the people of Sicily never forgot their promises to honor St. Joseph. Sicilian families would lay out baked goods and other delicacies on a table for St. Joseph’s Day, March 19. These offerings usually started out small, and often grew into multi-family and even parish-wise efforts. Bakeries would donate loaves of bread shaped as crosses and other religious symbols. Grocers would donate other foodstuffs, and all would be arranged for display, to show gratitude. Meat was usually not part of the spread on a St. Joseph’s altar, since it was both expensive and not permitted on St. Joseph’s Day (March 19th falling during the season of Lent). As the Sicilian influence in New Orleans grew, so did the tradition of the St. Joseph’s altar. Families would take pride in setting up an altar in the living room, or perhaps taking over the entire garage. Parishes and schools now do altars, and many families contribute either baked items or cash to the cause. Just as everyone becomes Irish on St. Patrick’s Day, Catholics (along with a few other Christians) become Italian for a while in March, as the altars are prepared. The faithful will then go around the city, from altar to altar, visiting family and friends. They’ll stop for a prayer or two, then leave some coins to help offset the costs of setting up the altar (leftover cash is then donated to the poor). On the way out, folks will stop and pick up a “lucky bean,” a fava bean symbolizing the restoration of the crops in Sicily. Now, go get some macaroni and cheese with red gravy, some gelato or Italian ice, and a lucky bean!